Did an alcoholic Dallas attorney see Lee Harvey Oswald and Jack Ruby together before the Kennedy assassination? I’ve been plowing through a new and fairly controversial book by Dr. Jeffery Caufield on the Kennedy assassination titled “General Walker and the Murder of President Kennedy”. The author’s website is linked here. The book details evidence of involvement in the assassination by The John Birch Society, The Minuteman organization, American Nazis and other elements of the far-right. It takes a look at how elements of these groups may have acted as foot-soldiers in the killing and has been criticized for straying from the alternate “CIA-did-it” story. This suggestion overlooks the possibility that one element (be it the CIA or Military Intelligence and far-right militants) may have been used by the other – as a “cut-out” to provide official deniability. With various questions in mind, I contacted my old friend and occasional research partner Carson Horton for his thoughts. Mr. Horton grew up in the Dallas area, His family knew first generation researcher Penn Jones, and he has a working knowledge of the Kennedy hit. Horton: The Dallas PD was then and still is, a very nasty piece of work. Not the least bit surprised to find that they might have been infiltrated by Birchers. My folks used to talk about heavily involved the JBS was in Texas politics back in the late 50s/early 60s and Dallas would have been the logical insertion point. We may have talked about this before but if not, you should do some research on a fellow named Carroll Jarnagin. Unusual spelling but that is the correct spelling of his last name. Jarnagin was an assistant DA in Dallas County at the time of the assassination and he is mentioned in the Warren Commission reports and in Penn Jones, Jr’s first book, Forgive My Grief, Volume I. It just so happened that Jarnagin had a brother who was an aerospace engineer like my own father and they were good friends. As a result I came to know Carroll some years later when I was a teenager. Jarnagin was a Dallas attorney whose testimony to the Warren Commission is found in the archives as C.E. 2821. His claim in those documents is that he witnessed Lee Harvey Oswald with Jack Ruby at Ruby’s Carousel Club. At the time, nobody knew who Oswald was, but Jarnagin heard Ruby and the man later identified as Oswald talking about killing the Governor of Texas. This account has been widely dismissed as the rantings of a drunk attorney looking for attention, but there may be much more to the story. “Mr. J. Edgar Hoover Director Federal Bureau of Investigation Washington, D.C. In a rambling reconstruction of the conversation between Ruby and Oswald, Jarnagin described going with a stripper who was his client to meet with Ruby on her behalf. Jarnagin claims that he made two anonymous calls warning that there was a plot to kill the Governor. Later he contacted the FBI with the information listed above. The FBI document is lengthy and can be read at any link to C.E. 2821. (1) From here on, do you intend to answer my questions with the truth? Answer: Yes. Indication: False. (2) Have you told the complete truth in this affidavit? Answer: Yes. Indication: False. (3) Did you actually overhear this conversation between Jack Ruby and Lee Harvey Oswald? Answer: Yes. Indication: False. (4) Were you drinking that night? Answer: Yes. Indication: True. (5) Did you actually see Oswald and Ruby at that table on the night of October 4, 1963? Answer: Yes. Indication: False. (6) Did you hear this conversation between these two men on that night? Answer: yes. Indication: False. (7) Did you hear the name of H.L. Lee in this conversation? Answer: Yes. Indication: False. (8) Is any part of this affidavit false? Answer: No Indication: False. (11) Did you hear everything that you put in this affidavit? Answer: Yes. Indication: False. The only two questions that Jarnagin answered truthfully were that he had been drinking and he was drunk. 1. Jarnagin was in private practice at the time of the assassination, not working for the DA. Talked to two different people and neither could confirm with certainty that he had ever worked for the DA but one said he had also been under the impression that Jarnagin had once worked for the DA’s office. The reference to Jarnagin and his ties to the DA’s office may have come from the Penn Jones book. 2. Jarnagin’s specialty was defending petty criminals and assorted disenfranchised types. The dancer he was with at the Carousel Club was a client who had asked him to go with her to the club because Ruby owed her money and was dragging his feet about paying her, which was a well-known Jack Ruby trait with many of the dancers he employed. 3. Jarnagin’s first sighting of Ruby and Oswald together was at the Carousel Club. According to my primary source, who is a fellow that knew Jarnagin very well, Jarnagin also claimed to have spotted Ruby with the same unidentified man (Oswald) at the Lucas B&B Restaurant prior to the assassination, but the B&B sighting was after he had first noticed them together at the CC. 4. Here is a link that provides a bit of backstory about the B&B, for what it’s worth. 5. On the night that Jarnagin first spotted Ruby and Oswald together, Jarnagin had accompanied this dancer to the CC to try and collect the wages that Ruby owed her. She specifically asked Jarnagin to accompany her to the club. Jarnagin was adamant that it was not a “date,” rather he was there in the capacity of her legal counsel, although he also acknowledged that they both he and the dancer been drinking. 6. Jarnagin’s story, confirmed by both sources, was that he had been inside a phone booth at the back of the club that was next to the table where Ruby/Oswald were sitting. While on the phone her overheard conversation that included a reference to killing someone. Knowing of course who Jack Ruby was, this piqued Jarnagin’s interest and so after he had ended his phone call he continued to act as though he was talking on the phone so that he could eavesdrop on the conversation. 7. During this conversation the two discussed killing John Connally. Jarnagin claimed that he never heard either of the two talk about killing JFK nor was there any discussion about why they wanted to kill Connally. This is an important point because some of the accounts of this story have stated that Jarnagin claimed to have heard Ruby/Oswald talking about killing the president but according to my sources Jarnagin never made this claim. 8. Jarnagin claimed that after overhearing the conversation and dispensing with his client’s business, he left the club via a back door which led down a flight of stairs to an alley. Upon reaching the bottom of the stairs he heard the door open and he turned around to see the man he later recognized as Oswald staring at him from the top of the stairs. 9. He stated that Oswald had his right hand in his coat pocket as if he was cradling a pistol. Jarnagin, who had on a long overcoat and a business suit, claims that he stuck his hand into his pocket and tried to act like he had a gun in his pocket., although he claimed that he was unarmed. 10. Jarnagin stated more than once that he felt this encounter with the mystery man at the top of the stairs was intended to intimidate him after Ruby and Oswald realized that Jarnagin may have overheard their conversation about killing Connally. 11. Jarnagin’s reason for not reporting any of this to the Dallas PD was because he knew that Ruby was well-connected to the DPD (which he also claimed that anyone in his position during that era would have known) and because of Ruby’s connections within the DPD, Jarnagin thought it would be better for his personal well-being if he kept his mouth shut. 12. Jarnagin also distrusted Henry Wade and did not believe that Wade would have taken him seriously. Hence he did not report his experience to either of these two law enforcement agencies, both of which were well-known to be corrupt and under the influence of mob money, according to Jarnagin. 13. My own experience growing up would affirm this statement by Jarnagin as it was definitely the opinion of people like my own parents, Penn Jones and others, that the entire Dallas law enforcement constabulary during that time, was not trustworthy and was at least as corrupt as the criminals they were supposed to be prosecuting. This is also an important point because of course none of the accounts of Jarnagin’s story ever bother to mention that the reason he did not report what he knew to the authorities was because he did not trust the Dallas constabulary. 14. Jarnagin did provide sworn testimony to the Warren Commission. Whether it was testimony before the publicly assembled commission or whether it was testimony taken in private, was not confirmed. Based both of my sources and on first-hand accounts that I heard from Jarnagin himself, he definitely provided testimony that was taken under oath by Warren Commission investigators. 15. His testimony concerned the sightings of Ruby and Oswald together at the CC and possibly the B&B with the qualifier that at the time he had spotted them he did not know who Oswald was and only pieced the puzzle together after the assassination when Oswald was identified as a suspect in the assassination of JFK. Again, the Penn Jones books may be able to clarify some of Jarnagin’s actual testimony. 16. After his testimony to the Warren Commission Jarnagin claimed that someone had tried to kill him. This part of his story is somewhat unbelievable as he claims that while he was lying in bed one night he felt a sharp pain like someone had stuck him with a needle or a “dart” as he put it. He then claimed that he became very ill, running a fever for several days during which time he was unable to sleep. Said he felt like he had the flu. 17. While he was still feeling the ill-effects of this alleged assault Jarnagin went to the Dallas County Sheriff’s office and asked to speak with the Sheriff himself, who was a man named Bill Decker. Jarnagin knew Decker and said that he was one of the few law enforcement officials in Dallas that he trusted. 18. Jarnagin claims to have asked Decker to place him in protective custody because he felt like someone was trying to kill him. According to Jarnagin, Decker did agree to place him under the protective custody of the Dallas Sheriff’s Department. 19. Neither source could confirm how long Jarnagin may have been under the protection of the Sheriff’s Department or exactly what that protection consisted of but this story is consistent among the sources that I have. It seems like there should be some sort of record somewhere that might confirm whether this part of Jarnagin’s story is true because if it is, then it should go a long way toward lending credibility to his claims. 20. Jarnagin also claimed that he started being followed after he had testified to the WC. 21. At some point after this chain of events took place Jarnagin disappeared from sight. My sources both think this was sometime in late 1964 or ’65. His whereabouts remained unknown for a period of five years at least. 22. One of the sources I have say that they do not recall his appearance at the family farm until around 1970-71. The farm was known to certain kids from a nearby high-school as an abandoned property with an old house on it where they could hang out drinking beer, smoking pot and screwing their girlfriends. Usual kid stuff. 23. It was through this network of local kids that one of my sources was introduced to Jarnagin as he had started dating a girl who was among the kids who had taken to hanging out at the farm. This would have been around 1972-73. My friend would have been 16 or so and this girl would have been around 18-19 years old. 24. My other source is one of the kids who went to this high school and was quite a bit older than I am. Probably five years or more, which means he would have been graduating from HS around the time that Jarnagin first appeared at the farm, assuming this to be circa 1970-71. 25. According to the story when Jarnagin first appeared at the farm he tried to run them off but they kept returning to the farm, plying Jarnagin with beer and pot; both of which he was very fond of. Apparently Jarnagin did not entrench himself at the farm immediately but rather he came and went for a period of time until he finally became comfortable with a core group of these kids, at which point he settled as a permanent resident at the farm and started to share his reasons for wanting to hide out at the farm. 29. By the time he did reappear at the farm he was definitely a blithering drunkard but there is something of a consensus of opinion that he was probably a lot more lucid at the time of the assassination than he was a decade later. 30. Both of my sources feel that the references by various members of the constabulary to Jarnagin being an untrustworthy drunk were probably based loosely on fact but that they were blown out of proportion in an effort to discredit his testimony. 31. Both sources also stated that there was a Time Magazine article that ran in 1983 in commemoration of the 20th anniversary of the assassination, which includes an entire page about the Carroll Jarnagin story. They said that Jarnagin had an old yellowed copy of the magazine that he kept around for years and would show people when he recounted this tale to his minions, who would gather around a campfire in his backyard, drinking beer and listening to Jarnagin regale them with tales of the wild and wooly Dallas underworld of the 1950 and early 60s…you might be able to find the magazine somewhere? 32. Jarnagin became sober in the early 1980s after he was contacted by Larry Keith Robison. Robison was one of the kids who used to frequent the farm in the early days before he enlisted or was drafted into the Army. Jarnagin always told me that he knew Robison was crazy and wasn’t surprised that he had murdered six people. At any rate after Robison was arrested for murdering half a dozen people in 1982 he contacted Jarnagin and asked Jarnagin to be his defense attorney. 33. Jarnagin had to reactivate his law license, which he did after completing a substantial course load of continuing education courses in record time. So quickly in fact that there was some sort of recognition extended to Jarnagin for being the “most up to date” attorney in the Texas Bar after he successfully regained his law license. 34. He defended Robison in his initial trial but when Robison was found guilty and given the death penalty the case was remanded to an appellate court and Jarnagin did not handle the appeal. Robison was subsequently executed in 2000 and Jarnagin always claimed that Robison had told him that was exactly what he wanted. Robison was diagnosed as a paranoid schizophrenic while in the Army and was discharged into the general population rather than being referred for psychiatric treatment to the VA.
35. Jarnagin remained sober for the rest of his life and continued to practice law until shortly before his death in 1998. 36. One of my sources remained in contact with Jarnagin throughout his life and visited him in a Ft. Worth hospital less than two weeks before he died. He died of lymphoma which had been largely untreated until it had reached the point where he was terminally ill.
37. Until the day he died no one who knew Jarnagin ever recalls him having changed any of his story about the events surrounding the Kennedy assassination. It has been repeated to me by more than one person that over a period of more or less thirty years he told exactly the same story every time he told it. Even when he was as drunk as a skunk. In my view this is an important detail that is suggestive of his story being mostly true. The times that I heard him discuss these events his story was always the same, although our conversations about the subject were not as frequent or in-depth as those that some of my friends would have had with Jarnagin. 38. Of biographical noteworthiness: Jarnagin was a decorated WW II veteran who served in the Air Force and received some sort of commendation for bravery. He served as a navigator on multiple bombing missions although I don’t recall whether he saw action in the Pacific or in Europe. 39. Tidbit of trivia related to this story: The Jarnagin farm is right across the road from the Rosehill Cemetery where Oswald is buried. The street is called Sandy Lane. When Oswald’s body was exhumed in the 1980s, Carroll and a group of his acolytes assembled in his front yard and caravanned over to the grave site to witness the exhumation. He stated that there was a screen of some sort that had been put up around the grave so that the assembled crowd was not actually to see the casket being removed from the ground. Once it was visible it was sitting on a metal stand with wheels at which point it was wheeled into a small shed-like building that was referred to as the caretaker’s shed. Here’s a link to an interesting story about Oswald’s grave: http://www.roadsideamerica.com/story/32266 I have been to the grave many times and remember it before the appearance of Nick Beef. I attached a screen shot from Google Earth that shows roughly where the Jarnagin farm is located. The residential development to the north would not have been there in the 1960s or probably even the early 70s. My dad told me that the farm at one time extended all the way to Highway 180. In the lower right is a gas well; the infamous Chesapeake Energy fracking operation, no doubt. By the time I started to visit the place in the late 1970s it was more or less the property that is outlined in red. Oswald’s grave is in the center left part of the cemetery to the west of Sandy Lane. The location of the two Jarnagin homes is noted. The buildings closest to Hwy 180 date to the late 60/early 1970s as do Buttercup Lane and Boswell Drive. We used to access the property from the driveway at the corner of Buttercup and Boswell. The newer facility in the upper area that is accessed via Sandy Lane has been built since I left Texas in 1989 as were both of the facilities you see next to Sandy Lane that are located on what used to be the old farm. The residential development that is immediately north of the farm, to the east of Sandy Lane would not have been there at the time Jarnagin settled in. Some of the development west of Sandy Lane, north of the cemetery was probably there but not a lot of it. All in all this place was a lot more isolated in the late 1960s that it is these days. Mr. RUBY. There is an organization here, Chief Justice Warren, if it takes my life at this moment to say it, and Bill Decker said be a man and say it, there is a John Birch Society right now in activity, and Edwin Walker is one of the top men of this organization–take it for what it is worth, Chief Justice Warren. Unfortunately for me, for me giving the people the opportunity to get in power, because of the act I committed, has put a lot of people in jeopardy with their lives. Don’t register with you, does it? Chief Justice WARREN. No; I don’t understand that. Mr. RUBY. Would you rather I just delete what I said and just pretend that nothing is going on? Chief Justice WARREN. I would not indeed. I am only interested in what you want to tell this Commission.That is all I am interested in. Mr. RUBY. Well, I said my life, I won’t be living long now. I know that. My family’s lives will be gone. Chief Justice WARREN. This story was given by a lawyer by the name of Mark Lane, who is representing Mrs. Marguerite Oswald, the mother of Lee Harvey Oswald, and it was in the paper, so we subpenaed him, and he testified that someone had given him information to the effect that a week or two before President Kennedy was assassinated, that in your Carousel Club you and Weissman and Tippit, Officer Tippit, the one who was killed, and a rich oil man had an interview or conversation for an hour or two. And we asked him who it was that told him, and he said that it was confidential and he couldn’t tell at the moment, but that he would find out for us if whether he could be released or not from his confidential relationship. He has never done it, and we have written him several letters asking him to disclose the name of that person, and he has never complied. Mr. RUBY. I am in a tough spot, and I don’t know what the solution can be to save me. And I know our wonderful President, Lyndon Johnson, as soon as he was the President of his country, he appointed you as head of this group. But through certain falsehoods that have been said about me to other people, the John Birch Society, I am as good as guilty as the accused assassin of President Kennedy. How can you remedy that, Mr. Warren? Do any of you men have any ways of remedying that? Mr. Bill Decker said be a man and speak up. I am making a statement now that I may not live the next hour when I walk out of this room. Now it is the most fantastic story you have ever heard in a lifetime. I did something out of the goodness of my heart. Unfortunately, Chief Earl Warren, had you been around 5 or 6 months ago, and I know your hands were tied, you couldn’t do it, and immediately the President would have gotten ahold of my true story, or whatever would have been said about me, a certain organization wouldn’t have so completely formed now, so powerfully, to use me because I am of the Jewish extraction, Jewish faith, to commit the most dastardly crime that has ever been committed. Chief Justice WARREN. Well, I am afraid I don’t know what power you believe he relinquished to them. I think that it is difficult to understand what you have to say. Mr. RUBY. I want to say this to you. The Jewish people are being exterminated at this moment. Consequently, a whole new form of government is going to take over our country, and I know I won’t live to see you another time. At this time he repeated the information set forth in his lengthy written statement submitted to the FBI, Washington, D. C., with a letter dated December 3, 1963. 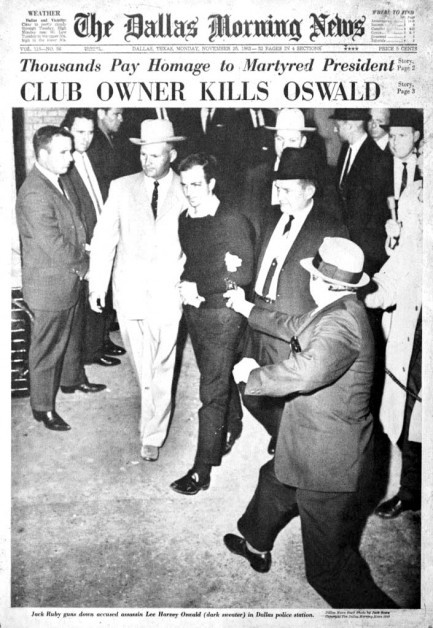 One change In the information related by him with that previously submitted in writing was that when he related a portion of the events allegedly occurring on October 4, 1963, at the Club Carousel, he was asked who RUBY introduced as a celebrity, and he stated that he did not see this person that JACK RUBY mentioned and thus, is not sure that this individual was there. He was then asked what name was called out by JACK RUBY as being the person at the table indicated, and JARNAGIN replied “General WALKER .” JARNAGIN was immediately asked if he had not placed General WALKER in his story on this date because of the publicity given on December 6, 1963 ‘ in the Dallas newspapers and on Dallas radio stations regarding the report that LEE HARVEY OSWALD was the person who took a shot at General WALKER on April 10, 1963 . No previous mention had been made of this in the press until December 6, 1963 . JARNAGIN denied that he had even read a Paper that day (December 6, 1963), but finally admitted that hc had heard the news on his alarm r did on the early morning of December 6, 1963, but did not . recall hearing General WALKER’. name . He was asked why he had not mentioned General WALKER’S name in the written statement furnished by him with his letter of December 3, 1963, and he stated that he did not include his name because he did not recognize General WALKER at the Carousel Club on the night of October 4, 1963, and does not believe he was there. JARNAGIN advised that on the evening of December 6, 1963, prior to being interviewed, he had considered the possibility that his mind was playing .’trick on him and that he imagined the conversation, but he stated that he had reached the conclusion that this was not true, and that he did hear the conversation as related. Jarnagin maintained that he had made several calls about the plot to kill the Governor of Texas. On December 5th 1963 he wrote a letter directly to FBI Director Hoover regarding the meeting between Ruby and Oswald. He had stated he did not trust Dallas authorities. He told journalists that on a separate date he witnessed Ruby with Officer Tippet and Bernard Weissman. He submitted to a lie detector test, which may have been fixed – or, Jarnagin may have altered or embellished his story which caused the test failure. His testimony is on record in The Warren Commission Report as C.E. 2821. As described by Carson Horton, Jarnagin stuck to his story and it was the same every time he retold it. In my opinion, some element of this saga has to be true. As an attorney, Jarnagin well knew the implications of providing false testimony to the FBI. What seems likely is that Jarnagin did actually witness something close to his testimony, and with the entire Dallas legal system stacked against the conspiracy angle of the assassination, his witnessing Ruby and Oswald together was easily dismissed as the ramblings of a drunken, attention-seeking lawyer. As with many of the mysteries of the Kennedy assassination, we may never truly know. This entry was posted on April 29, 2016 at 6:21 pm and is filed under Book review, Hidden History, Tell the truth and run !. You can follow any responses to this entry through the RSS 2.0 feed. 6 Responses to Carroll Jarnagin; Did He Actually Witness Ruby With Oswald? -But- Jarnagin had info that could have prevented the plot perhaps? Was Larry Crafard one of the “Oswald doubles”? they have seen Jack Ruby and Lee Harvey Oswald together. 7.Margaret Cartland Husband.8,Billy Briggs Ruby bandleader. Employees -even Mark Lane recorded some of them. 19.Clyde Malcolm Limbough 20.Leander D’Avery 21.EtC. They all cant be Wrong Someone must be Right -Above? Infor provided by John Armstrong Collection ..
Crafard’s photo appears in the Hearings & Exhibits and, in colour, in one of Groden’s books. Apart from the fact that they are similar in age and coloration, Crafard does NOT resemble LHO, and is certainly not a lookalike. This was a red herring planted by the WC to explain away reports of Ruby & Oswald together, and endorsed by Ruth Payne. It is interesting that the “Lee” descrbed by Jarnagin calls himself “H.L.Lee”, which is phonetically identical to “H.O.Lee”, the alias LHO used at his rooming house. I was one of the high school kids who visited “Mr J” as we called him. There was a group from my HS that took him camping with them to Enchanted Rock. He spouted off a lot of crazy stuff about JFK, we didn’t know whether to believe him. It was just a place for under age kids to drink beer.